I looked up my motherboards compatible processors list once more to be sure, and sure enough the i7-3770K was on there, though it displayed that it needed an updated BIOS. I went to make sure my motherboards BIOS was up to date, and it was, displaying it was at version 3603. I also tried removing the CMOS battery for a while as I found that suggestion while looking for answers. That didn't seem to do anything. I then made sure my power supply was good enough, and it seemed to be more than enough for the job, it's 650W and I haven't come close to maxing it out. Now I then put my old i5-2500K back inside and it booted up just fine, so i'm not sure what the problem was, if it was a defective CPU or what. I sent the CPU back to the seller hoping it was just defective, and took this opportunity to clean out and reassemble my computer. After this however my computer now sometimes has the same problem with my i5-2500K. The difference being that my computer does boot up properly once I forcibly power it off when it's hanging. Another difference is that it once showed the opening BIOS screen thing where it told me to press DEL to enter setup, but then went black. This time however the monitor showed as receiving a signal. So now and then my computer will just not boot properly and hang indefinitely, and I have no idea if it was something I did while reassembling it, if it was something putting in the i7-3770K did, or if it was something else entirely. One thing I thought might be an issue though, is that my power supply has a dent in it, around the socket. I fiddled with it trying to get a closer look while reassembling and may have made it worse. IF it is something wrong with the power supply though I can't imagine why my computer isnt just turning itself off intermittently or when I jiggle the cord. When it properly boots it doesn't seem to show any other problems. Also, when removing the CMOS battery I worry I might have damaged it or the socket it goes into, but I have no idea if that is the case or if it would do anything to the boot up. So what I would like help with is finding out why my computer is doing this, and also finding out why it wouldn't work with a chip it clearly stated it was compatible with. I asked the seller to test the chip on their end to confirm if it was defective or something is wrong on my end, but I am leaning towards it being something wrong on my end with my recent i5-2500K problems. Help would be much appreciated as this issue is driving me nuts! ASUS P8Z68 Series boards incorporate universal inclusion of LucidLogix Virtu™ switchable graphics to harness the capabilities of Intel® Quick Sync Video, along with the most precise digital power design, smart UEFI BIOS, and Intel® SSD caching. Once downloaded, right click the file, properties, on the general tab check "Unblock", click OK, and then extract the BIOS file to a USB drive. Before flashing the BIOS make sure to load BIOS defaults. Flash the BIOS and then after it starts up with the reflash load defaults again. You're just trying to make sure there's no corruption (it happens) in the BIOS flash or config. I will make sure to try doing that when the replacement arrives in the mail. For loading BIOS defaults, there should be something pretty plainly labelled in the BIOS menu for that, right? Do you think that might help with the current chips issues as well? On the driver web page it says only for Win7 and Win8, does that mean this wont work at all with Win10? I think reflashing to an older version may have helped, I will keep an eye on it and see if it works with the new processor once it arrives. One new issue that it introduced is that my keyboards num lock light will stay lit during boot up and the Windows Key disable lock will blink on my K55 keyboard, and sometimes it won't take my delete key when I want to go into the BIOS settings and just pass it by and boot normally. You should have reflashed with the most recent BIOS not an older one. There may have been a fix for the keyboard detection. My only suggestion is to try a different USB port. I prefer to use the ones left of the red USB ports (the stack of 4 black) to plug the keyboard in. If that still doesn't work you may have to get a "plain Jane" keyboard or see if maybe other's have had that problem with your keyboard. The driver page stopping at Windows 8 isn't surprising. Asus tends to not update their motherboards or drivers after only a year or so. Especially with the shift in driver design with Windows 8.1/10. Loading BIOS defaults should be on the very same page for exiting and saving. "Load Optimized Defaults" or "Load BIOS Defaults". I don't know which without digging into the motherboard manual. Does that mean they are not compatible with Windows 10 then? If not then I am assuming the Win 7 and 8 version of 3603 is the one I should flash yes? I will give that a try. I found the defaults button right on the main screen too so that was easy. The keyboard detection isn't too big of a hassle since it still works half of the time, and it works normally once everything is booted up. If everything goes back to normal after reflashing the BIOS, then what could have caused the corruption? Could it have been swapping CPUs? Or could it have been removing the CMOS battery or potentially damaging the socket the CMOS battery goes in? While changing the 3402 BIOS settings back to default, the restart and hang problem came back, so it looks like that didn't help after all. And after reflashing it to 3603, the problem persisted as well. It looks like this may not be due to the BIOS being corrupted. So after getting the replacement i7-3770k and installing it, my computer restarted itself three times before finally booting and recognizing the new chip! So at least that problem is solved now. The problem seems to have resolved itself with the new processor, thank you! 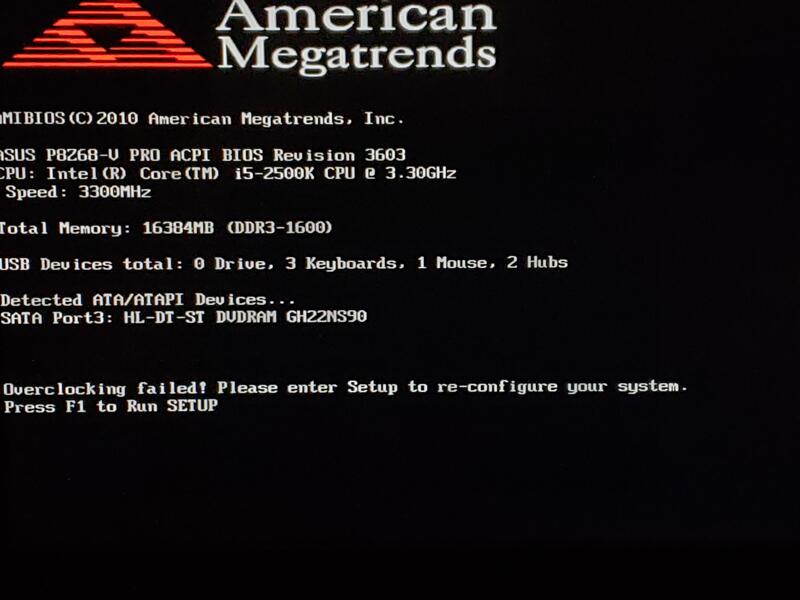 Question Why is my computer shutting down? I'm In trouble.. Bent Motherboard Pin On Wife's Computer!